If you have embarked on renovating your home or building a new one, one of the things you may be thinking about are the windows and doors of your house. Conventionally, wooden windows and doors are installed but before you opt for the traditional approach; there are other options that are worth considering. · Whether you are a homeowner renovating or setting up your house or a business owner who seeks to secure their premises, you may be thinking about wooden windows and doors, especially for the back and front doors. However, while a wooden window or door might have that appeal of wood grain and can be more affordable than steel windows or steel doors, they are not necessarily a worthwhile long-term investment. · Wood can bow, twist, peel, bubble or warp due to weather conditions and would need to be replaced at this point, which means you are likely to end up spending more. · With these factors in mind, it is important to be aware of various aspects of steel windows and steel doors and how they can fit into the daily operations of your business or home. Steel window and door manufacturers are always available to address customers’ needs and concerns. One of the key things to note about steel windows and doors is that contrary to popular belief, many windows and doors are not completely made of steel. A solid metal door is often found in places such as marine or military bases but can be too bulky or heavy for homes and most businesses. Click here for Optimum steel windows and doors. · Steel doors are ordinarily made of a foam or wooden core that is covered by steel with a specified coating in terms of centimeters or thickness as well as a weight. Steel windows basically consist of glass and a steel framework. · If you are concerned about aesthetics, the good news is that doors can be coated in steel externally and have oak or hardwood moldings internally. This means that you will be able to secure your home while the door still looks attractive. · Steel windows provide your establishment or home with a look that can be described as slightly industrialized and giving you unrestricted views of the outside. · Since steel doors can be a major investment if you make the decision to install them in your entire home, it is advisable to utilize them for rear and front entrances. This ensures that you have tamper proof doors that can also handle heavier locks. 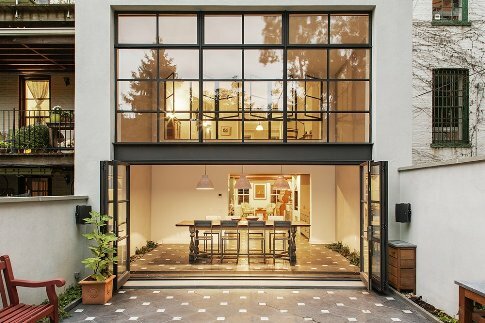 Although steel windows and doors may not be your first choice when you want to shop around for your home, you will be pleasantly surprised by the benefits they provide. · Steel is strong and steel windows feature thin sight lines that give you clearer views from the windows. · Steel windows and doors do not require a lot of maintenance. They are not susceptible to rust, bowing or cracking. · Steel doors can minimize cooling and heating costs with their insulating properties. · Steel doors are fire resistant at various levels. · Steel windows and doors can be repaired easily and do not need to be repaired frequently.